Today I am feeling determined! Determined to make more vegetarian meals and make them on a regular basis. I’ve always loved vegetables and I’ve always cooked with lots of them but i’ve never been able to convert to being a full on vegetarian because I just love food so much and that includes meat. I don’t eat massive amounts of meat and I don’t eat it every day but i do love a good BBQ and I don’t think I could ever really give up on the thai beef salad…just being honest here! 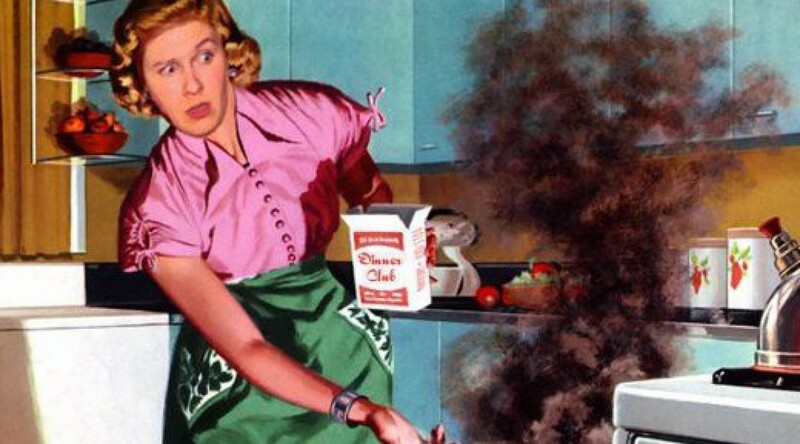 My determination to cook more vegetarian dishes is coming for a few different reasons. 1) cooking, thawing, marinating and grilling meat…takes time…time that I don’t always have. I often do my meat shopping and then freeze it so I have it on hand so that adds another layer of complexity and preperation when I include meat in my dinner plans which isn’t always feasible. 2) The price has skyrocketed lately. It has seriously infuriated me being at the grocery store lately with a particular dish in mind only to be insanely ticked off when I look at the prices. Out of principle alone, I have walked off in a huff. Vowing to make a peanut butter sandwich or have eggs on toast before I pay that price. So my moody little friends, I am determined to get wicked creative and make some killer veggie dishes this winter. Why not, I love veggies, my family loves veggies, they are quick to prepare, they taste crazy delicious and for the most part are pretty affordable as long as you buy whats in season. As many of you know, my moody little family loves tacos!! So today’s dish is an easy way to bring veggies to the dinner table and transition it in to a family fave. I had some beauty sweet potatoes left over from last weekend that I didn’t end up using so it was time to turn those little gems in to something great. My pantry is also starting to look like a storm cellar so it is time to stop rationing cans of beans for the apocalypse and start actually using whats in my pantry. I found a can of black beans…SCORE! I’m going to whip up some delicious spicy sweet potato, black bean and corn tacos that are seasoned with honey, lime and some smoky spices that will bring it all together. Let’s pre-heat the oven to 425. First, peel and chop your sweet potatoes in to half inch pieces. TIME SAVING TIP: Okay if this is a dish that you want to make hella easy during the week after work, you can prep a few things in advance so make your life wicked easy. 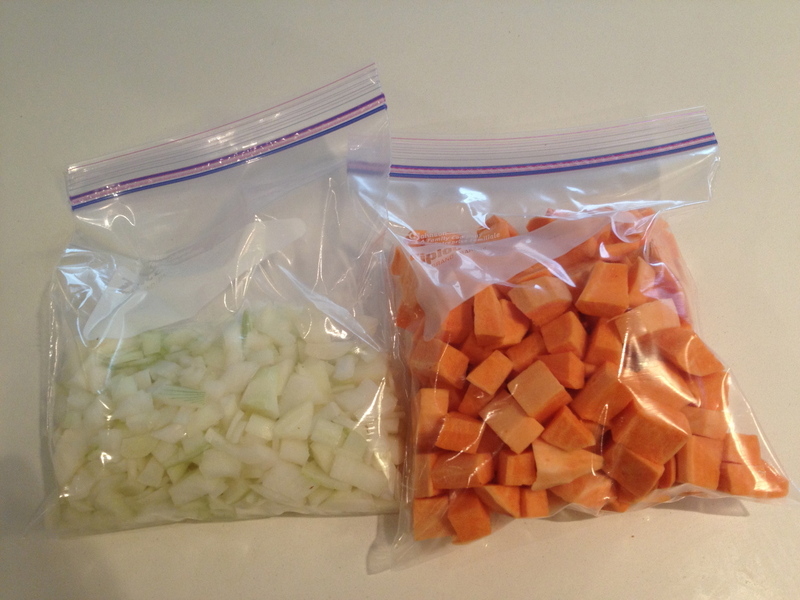 Peel and chop your sweet potatoes and place in a zip loc bag or a container in your fridge. Do the same for your onions and red peppers. Now you don’t have to peel or chop anything the day of. I sometimes do this on a Sunday and get a head start with a few meals for the week and cut down on lazy take out when I can’t be bothered. Next you want to place them in a roasting pan/dish and pour a good glug of evoo over the potatoes. Add your spices such as cumin, dried ground coriander, ancho chilli, smoked paprika, mexican oregano (if you don’t have this, just use regular), salt, pepper and make sure the spices and olive oil completely coat the sweet potatoes. Roast these little gems for 15 minutes or until they are completely cooked through and tender. If you want them a bit more roasted, then roast for 20-22 minutes. In a fry pan, sauté your onions with a bit of oil until they are translucent. Add your chopped red peppers and one clove of garlic minced and mix it around with the onions. 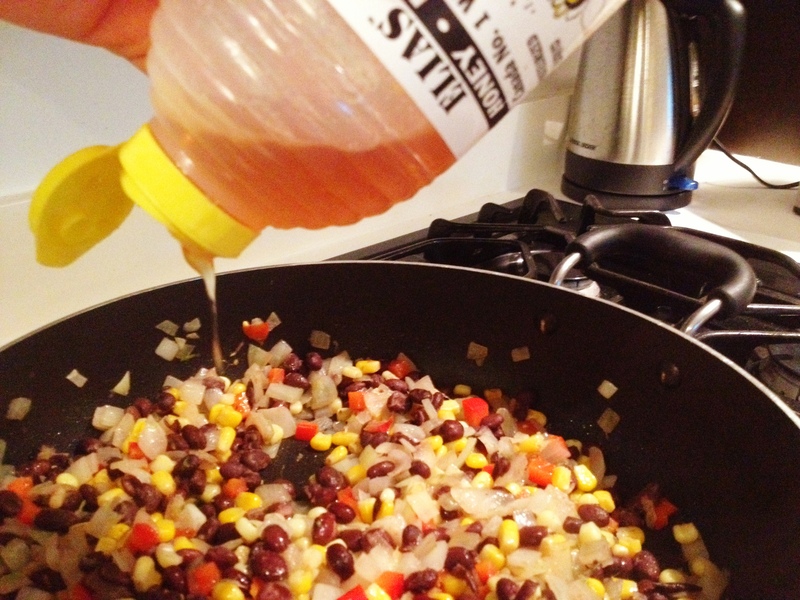 Next, add your thawed frozen corn, one can of black beans (rinsed and drained) and mix around. Now that the mixture is nice and hot, add a liberal squeeze of honey, the zest of 1 lime and the juice of one-two limes (or 2 Tbsp of lime juice depending on how ‘limey’ you want it to be and how much juice you actually get from the lime). It the mixture will become shiny and beautiful and will have a nice tang to it. 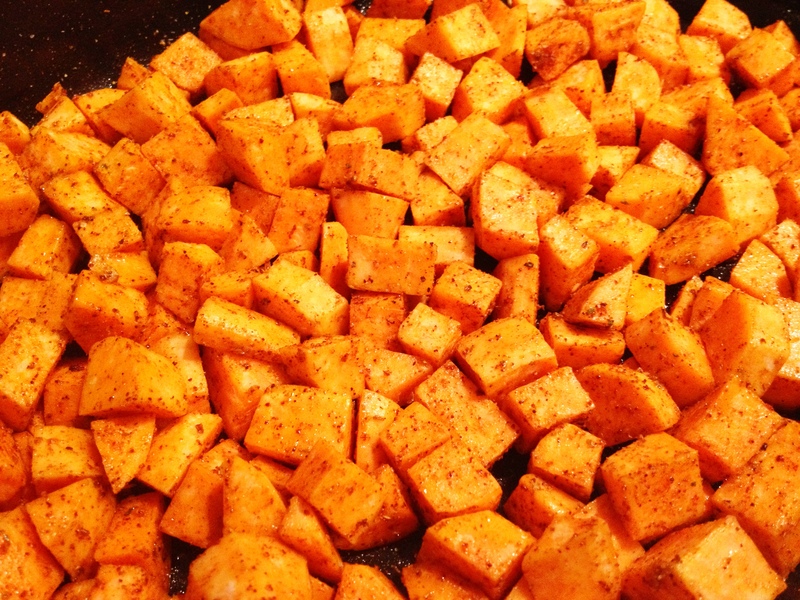 Now add your roasted sweet potatoes to the skillet and mix around so that the bean, corn, honey and lime mixture coat all of the sweet potatoes. MMMMMMM. It smells awesome. Now you can use this as the base to your tacos. 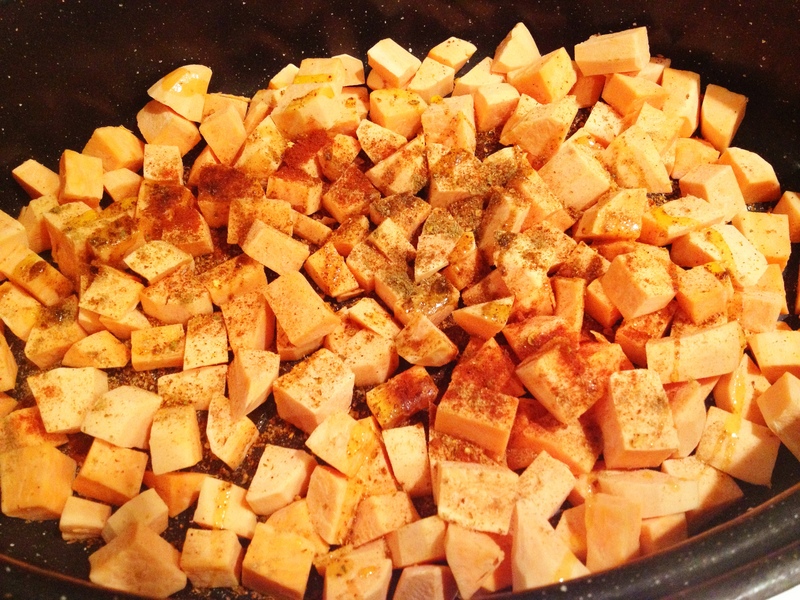 Add the sweet potatoes to the skillet and mix together until the mixture gets coated with the honey and lime. The topping possibilities are limitless!! I have often added, my picked red onions, cilantro, avocado, shredded cabbage, grated cotija cheese, sliced/picked radishes, lettuce…you name it, it will probably work! A lil crunch goes a long way. 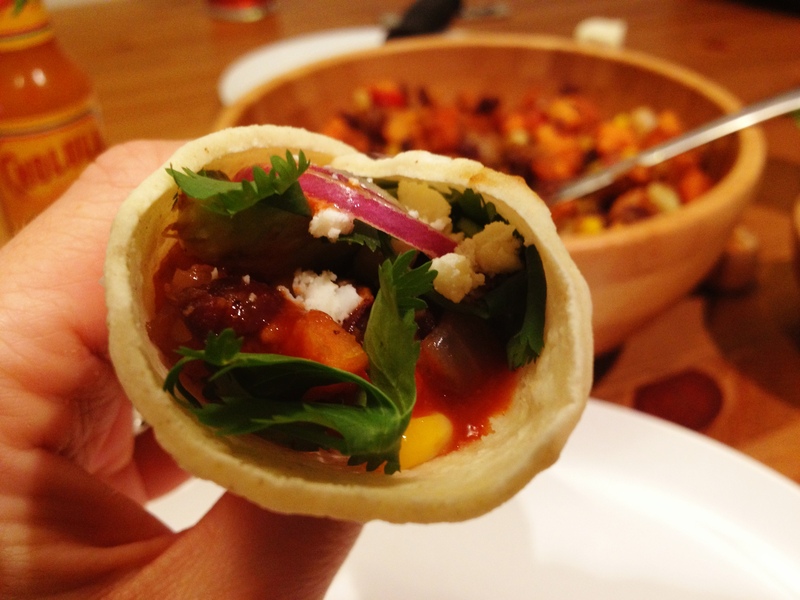 Serve with some corn or flour tortillas and you just upped your dinner game! MMMM look at these bad boys??? Little pockets of awesome!! 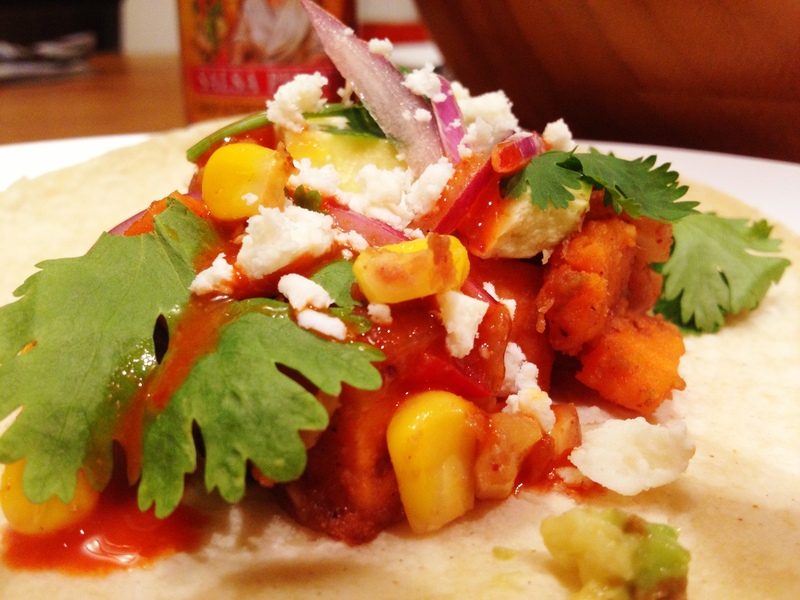 I added, cilantro, avocado, pickled red onion, cotija cheese and a bit of hot sauce. 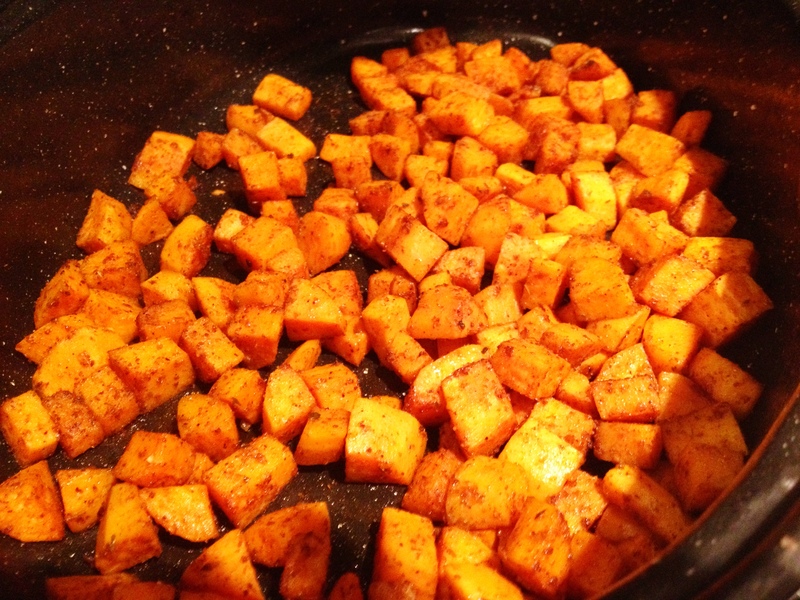 Add your sweet potatoes to a roasting pan with EVOO and all of the dried spices and mix until well coated. 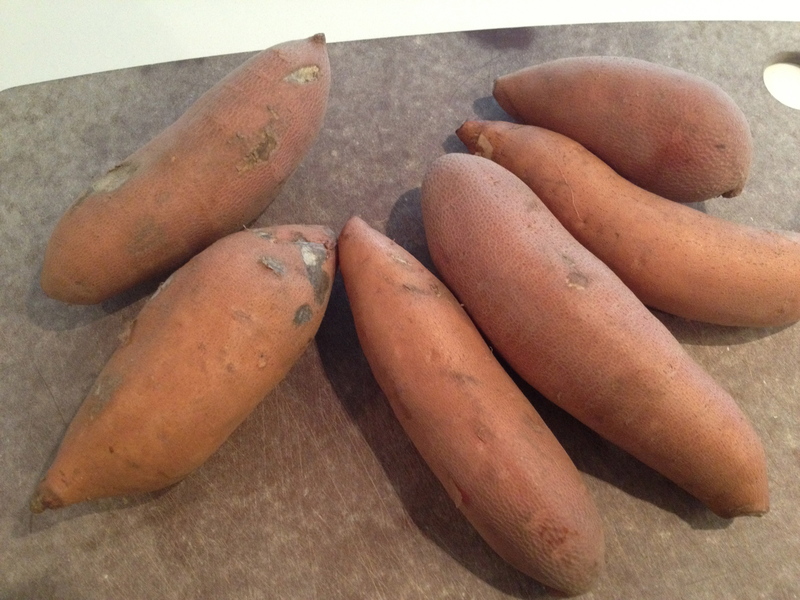 Place sweet potatoes in the oven and roast for 15-22 minutes or until tender and cooked all the way through. Warm up a fry pan (deep dish skillet would work great) and add some EVOO. Sauté your onion until it’s translucent. Add the garlic and red pepper and cook for another few minutes until the peppers are cooked. 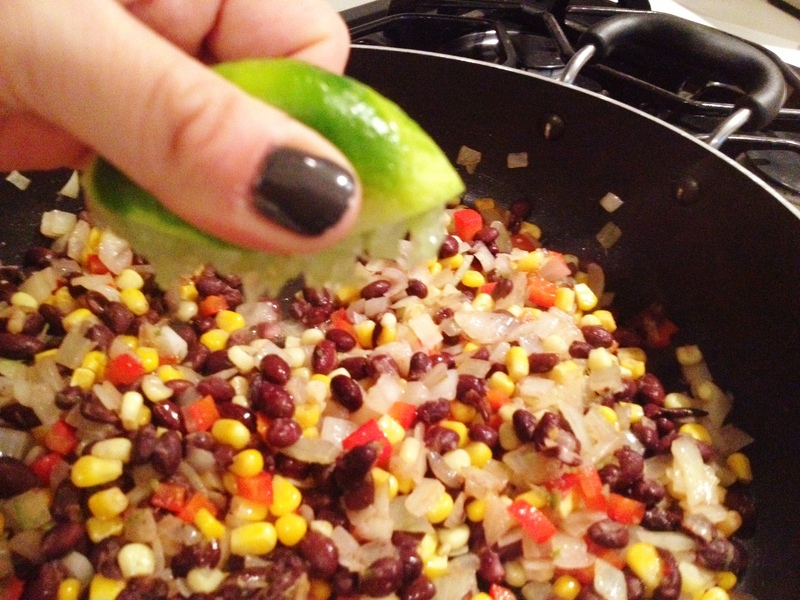 Next add your corn, black beans and mix around until warm. Add your honey, lime zest and lime juice and mix thoroughly. 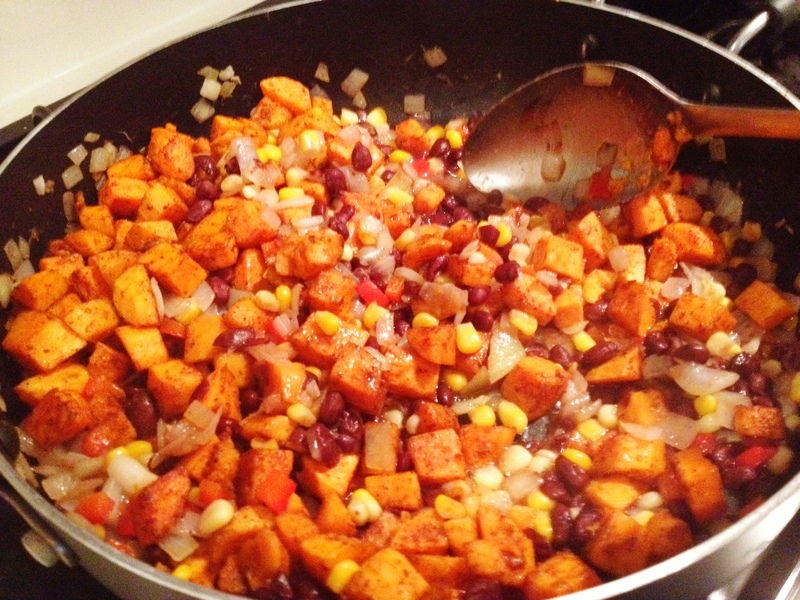 Add your roasted sweet potatoes to the bean and corn mixture and mix together until well coated. I hope you fine people like this easy, vegetarian dish. It’s hearty, delicious and takes no time at all. Its got a bit of heat and a bit of sweet. Love the lime flavour that shines through. Its basically pretty awesome to make a root vegetable kicked up with citrus flavour. Fall is super confused right now!! Just sayin’. Most of you will have these ingredients in your freezer, fridge or pantry so it’s a real great dish to throw together on a weeknight. The other great thing about this dish is that you will probably have a lot of left overs so you will be the envy of your workplace lunchroom the following day.